Paula’s Black and White Sunday theme is macro this week. My photo isn’t really macro, just close up and I’m never too sure about flowers in black and white, are you? Still it is in decay so perhaps that helps/. Join Paula at Lost in Translation, you’ll get a very warm welcome. I was reluctant about monochrome flowers at first, but it can work out very nicely like in this case. Decaying ones especially lend themselves nicely to such edit. Thank you, Gilly. It looks familiar, but I still don’t recognise the flower. It is an agapanthus Sue. They are lovely in seed. Yes, reminds me I might have an image somewhere…. Me too – or even three! I am totally with you regarding flowers and black and white – after all the beauty of a flower is often in its colour. 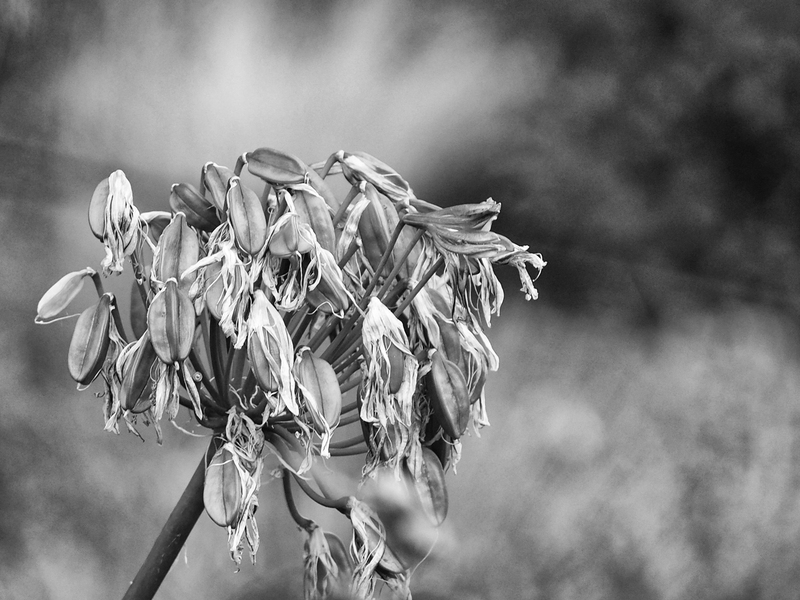 However, when it comes to seed-heads and decaying flowers the monochromatic look works well as it defines the structure. This one is lovely as you have captured the light and also have a soft focus in the background. Thanks Jude, I think softer monochrome shades can work better for flowers, even just sepia to warm things up. Probably mourning it’s loss of beauty! I love this a lot – and i think th mono adds a great mood…. An agapanthus that has seen a better day .. Flowers dying make great models ..